You might remember a few weeks ago I went thrifting with my sister and bought this Dress-up Rainbow Brite doll. She was quite dirty. Her hair was covered in something I'd rather not think about. Her dress was spotted and soiled, as were her legs. 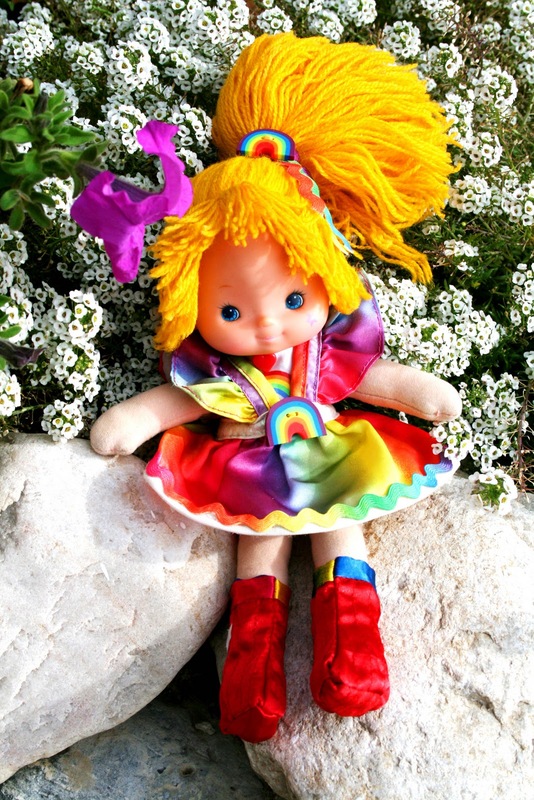 If you buy a RB Dress-up doll like this in mint condition it would cost around $30-$40. Some sellers have them priced around $80. I thought I would try to salvage her as best I could. First, I washed her dress and her body. The thread on the hem of the dress was destroyed and there was no longer a rainbow belt decal. Her shirt and shoes were gone. I ran over to the craft store and bought some ric-rac in rainbow and a few rainbow-shaped buttons. I sewed those on. Her hair was a chore. I had to do a lint shave and cut off the scraggly ends. Then I went on eBay and found some shoes for $5 shipped. Isn't she purdy! Are you now resisting saying, "DOUBLE RAINBOW ALL THE WAY?" The only thing I'd like to change is the undershirt. I had to make do with a piece I found at an antique store and I'd rather have a red shirt like the original doll. Oh well! I wanted this doll so much when I was a kid! WoW! I noticed her smile got bigger!